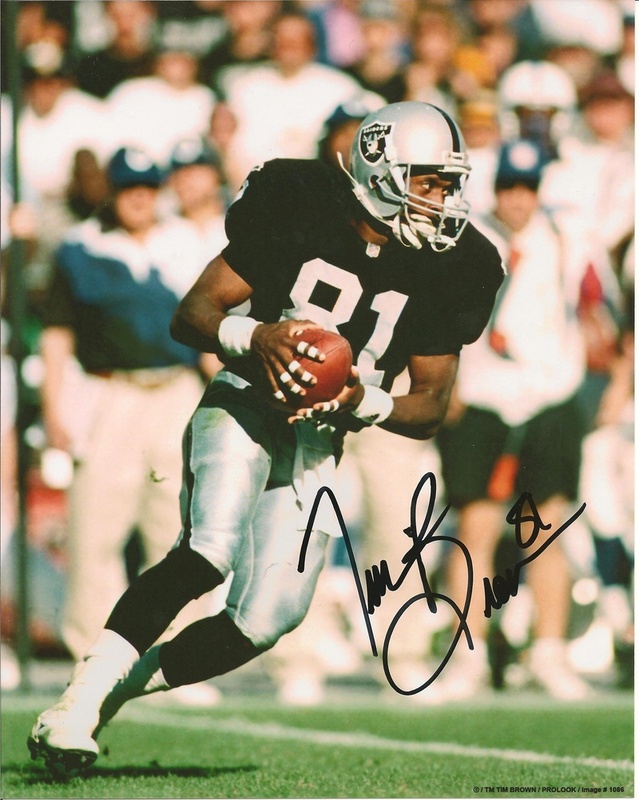 Tim Brown's cards and autographed memorabilia have a tremendous following by both collegiate and pro collectors. 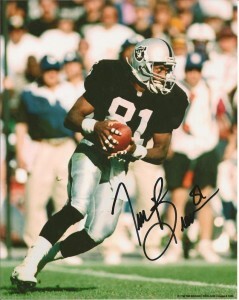 He spent all but one of his 17 years in the NFL with the Los Angeles/Oakland Raiders franchise. During that time, he was selected to the Pro Bowl nine times and retired with 19,683 all-purpose yards and 105 touchdowns. 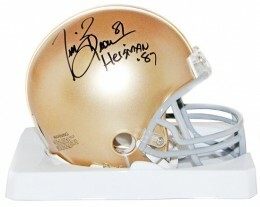 Brown was also a two-time All-American at Notre Dame and won the Heisman Trophy in 1987. 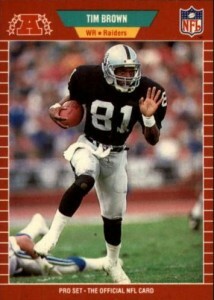 Tim Brown has three rookie cards, all of which were released in 1989. He also has several other first-year insert cards from that same year and four of them are part of the 1989 Score set. One of the Score cards (#305B) corrects an error that actually pictures fellow wide receiver, James Lofton. Additionally, he has a pre-rookie card from 1986 Brownell. 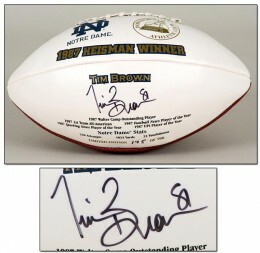 Tim Brown's first certified autograph card was issued in the 1991 Heisman Collection I set. It is serial numbered to 200 total copies. In 1997, Collector's Edge produced Brown's first memorabilia cards. He has two Game Gear Quad insert cards in Extreme. One features a swatch of game-worn jersey. The other contains a piece of a game-used football. The other 1997 Tim Brown relic cards appear in Excaliber. Brown's Game Helmets inserts are short prints and have an announced print run of 249 copies, but they are not serial numbered. There is also a Tim Brown Game Helmets Autograph parallel found in the product. 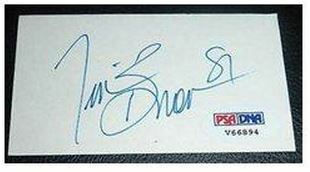 It is serial numbered to just 100 and is one of his most popular autographed memorabilia cards. 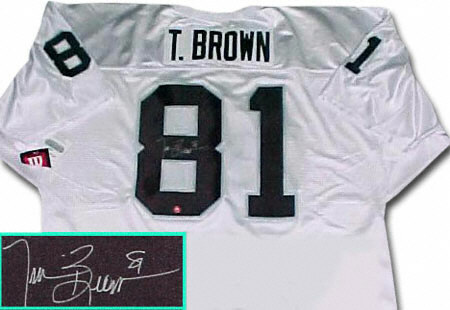 Tim Brown's autographed memorabilia has seen consistent demand through the years. New generations of Notre Dame and Raiders fans appreciate the contributions he made to their respsective organizations. He has been a willing in-person signer is also a frequent guest at sports collectibles shows and autograph signing events. The cards from this set were so heavily overproduced that they are nearly worthless. 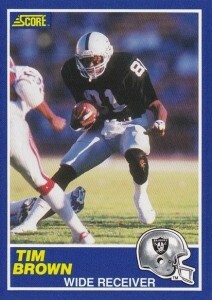 Even top grade Tim Brown rookie cards sell for as little as $10. There seems to be an equal split in popularity between this card and Brown's Topps rookie card. If you like in-action photography, this is the card for you. Professionally graded copies of this card receive a slight premium when returned in high-grade. Also, some collectors like being able to see the player's face on their rookie card. 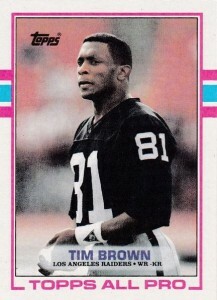 If that describes your preference, 1989 Topps is the best place to look for a Tim Brown rookie card. TIM BROWN CHRIS CHAMBERS 2001 ROOKIE AND STARS DUEL WORN JERSEY CARD #52 100! 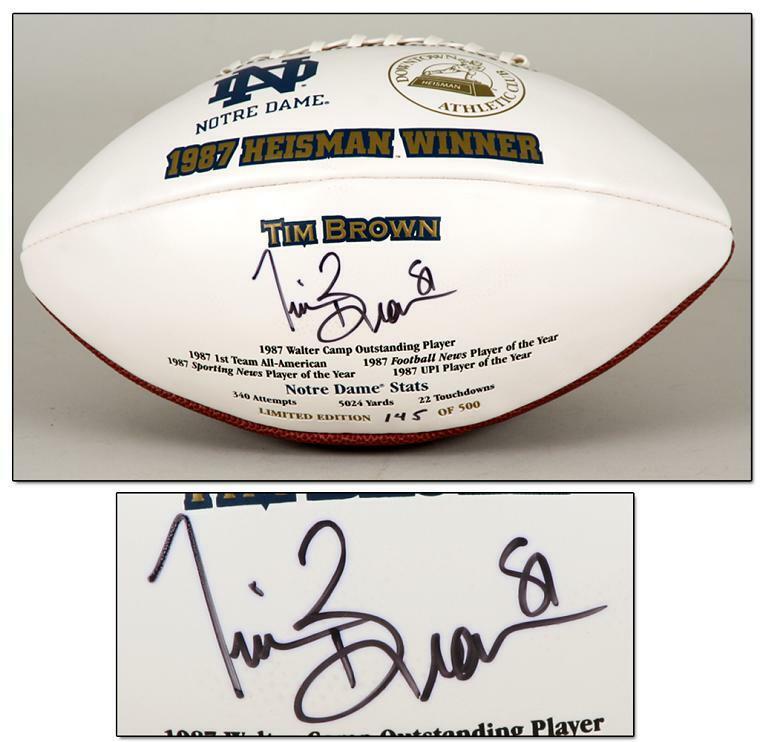 Below you will find examples of what an authentic Tim Brown autograph looks like. This can be used as a first point of reference for determining the legitimacy of autograph memorabilia, but is not a substitute for having your items authenticated by a well-respected professional autograph authentication company. Some of the trusted sources within the sports memorabilia market include the following companies: PSA, JSA, Steiner, Tristar and Mounted Memories. Click on any of the images below to view full size photos. A consistent signature with some unusual lettering but fairly legible. The "T" is written like a number "7." The "i-m" combination is discernible but he cheats a bit leaving a hump off of the "m."
The "i" is dotted haphazardly. The "B" can best be described as looking similar to a large number "3." The "r-o-w-n" combine into a single character that looks like "now" or "non." The signature finishes with a short, trailing horizontal tail. He almost always inscribes his jersey number "81." Raiders Receiver TIM BROWN Signed Mini Helmet AUTO - Heisman - JSA! !